The Intelligent Drive is actually pretty smart but also overly cautious. 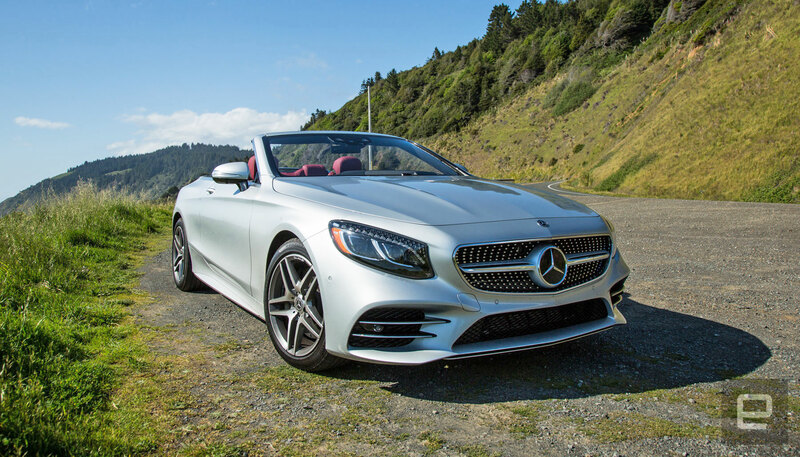 As the car approaches a sharp bend on a back road in Northern California, the $155,000 (starting at $99,900) Mercedes-Benz S560 slows down of its own accord. I guide it through the corner with a bit of help from lane keep assist. Then, as the vehicle exits to a straightaway it accelerates back to the adaptive cruise-control speed setting until it encounters another switchback. The latest S-Class luxury line of cars from Mercedes ships with an updated version of Active Intelligent Drive (the automaker's semi-autonomous suite) which uses data from Here maps to determine just how fast the car should take a corner. That means if you're doing 65 miles per hour using adaptive cruise control and the upcoming bend in the road is too sharp for that speed (according to Mercedes and Here at least), the car will automatically slow down to an appropriate pace. It's weird, helpful and an important step toward cars driving themselves safely. What's impressive is how well it works on two-lane roads off the beaten path. Typically you wouldn't think to engage adaptive cruise control in this type of environment because unless the car is tracking another vehicle, it goes as fast as you set it. Not exactly safe when you're likely to encounter turns. But in the S560 it was smooth (albeit slow) sailing. The automaker accomplishes this feat thanks to data it gets from Here maps. By determining the traffic, current speed and angle and tilt of a corner, the system figures out just how quickly the car should enter and exit a turn. It's really the mapping data that's key. Sure, autonomous vehicles will be able to "see" the road with their plethora of sensors and make decisions thanks to AI, but it's important to note that mapping is going to be key to all systems. Tesla uses data from cars on the road to map lanes for Autopilot. Meanwhile, Cadillac uses high-definition LiDAR mapping to make Super Cruise as spectacular as it is. In other words, if you're an automaker and want a car to drive on its own at some point in the future, you're going to have to plot the world in one way or another. That's what Mercedes is doing for its top-of-the-line S-Class. Throw in the car's ability to read signs, make automated lane changes with a tap of the blinker arm while in semi-autonomous driving mode and the car is as smart as it is luxurious. Of course, the $155,000 price tag puts the tricked-out convertible S560 out of range for most people. But those high-end features will eventually trickle down to vehicles most of us can afford. In fact, Mercedes is introducing its new (and vastly improved) infotainment system, MBUX on its entry-level A-Class. So the technology the automaker is brewing up shouldn't necessarily cost an arm and a leg and kidney and maybe a part of your liver. All of this is part of Mercedes-Benz's ongoing work to make sure its ready for a self-driving-car future. It helps that the automaker already understands luxury and making drivers and passengers feel pampered. If you're not driving because robots are taking care of it, you may as well feel good. But it'll be years before automatons take over the road. In the meantime, if you can afford it or you have the patience to wait for the feature to get into a car in your price range, Mercedes-Benz is making your backroad road trips a little bit more futuristic.